We work with agents from around the world to help international students study at Internexus. Join our network of quality agents and offer educational programs from prestigious Internexus San Diego. 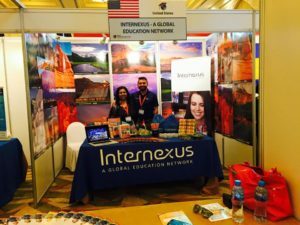 By becoming a Internexus agent, you can grow in your own field while helping students in your country to learn English in a unique, exciting and diverse environment. Let our 20 years of experience work for you. Be a part of a successful and growing organization and experience the difference! How would you profit from being a Internexus agent? · Internexus offers a special commission structure to its approved agents. · Internexus offers high quality education at affordable prices. · Our agents can offer San Diego, Salt Lake City and Provo locations to their students. · We have offer a variety of study options to meet your clients needs. We can also assist you with identifying accommodation options for your clients. · We provide our agents with marketing materials including brochures.